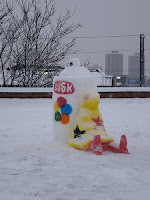 London graffiti veteran BUSK ONE certainly kept it fresh during London's worst snow for 30 years. Whilst kids were building snowmen, BUSK was busy in East London creating possibly the world's first Cheech Wizard Snowman. And with a can of trusty Krylon that size you need to keep your eyes peeled for a few Cheech tags on the Central Line this winter. Props to BUSK for freshness and originality. think i had a running with busk and skire back in the late 80's on the metropolitan line when i was bombing.....handbags at dawn stuff...we all grow up...but loved those days.